Local retailers seeking to maximise their returns during the recent Songkran holiday may have seen up to Bt25 billion in potential profits drained by inefficiencies in supply chain management, said logistics guru David Edwards, managing partner of Bangkok-based Logistics Bureau Asia. “Thailand’s Songkran boom is not so different from other celebrations like Christmas and New Year,” he said, adding that one of his firm’s major retail clients had reported a 40-per-cent jump in sales during the month of March. “What makes Songkran different from our perspective is the pronounced migration pattern away from urban areas to rural towns placing – often excessive – demands on the supply chain,” he said. Edwards’ firm specialises in helping companies achieve optimal supply chain efficiency by conducting comprehensive assessments of their existing structures and then recommending changes. Thailand in general, and Songkran in particular, posed an exciting challenge, he said. “During this one brief period Thailand’s entire retail and distribution structure is turned completely upside down,” he said. His company’s large retail clients had observed that just before Songkran there was huge demand in the city as people prepared for their journey home, with this suddenly switching and the pressure being placed on upcountry systems. “Companies seeking to effectively manage that transition can boost their bottom line through planning and preparation,” Edwards said. Edwards’ assertions are supported by figures from the Tourism Authority of Thailand. Hotels around the Kingdom enjoyed a bumper Songkran this year, as a 5-per-cent jump in domestic travel translated into an estimated 1.65 million Songkran tourists. This bumped occupancy rates to 100 per cent in many provinces and generated Bt11 billion in revenue for the tourism sector alone. Edwards said that many factories shut down over Songkran, requiring that retailers, hoteliers and wholesalers stocked up ahead of the rush. These excessive inventory holdings meant higher working-capital costs and could lead to inefficiencies at distribution centres as products were handled and re-handled due to space limitations. “Supply chains tend to employ low-skilled, low-paid temporary staff and these are the people that want to go upcountry,” he added. Logistics Bureau Asia’s study received reports of 40 per cent staff no-shows in Bangkok over Songkran. The reduced manpower levels translated into significant delays in the delivery process. At warehouses it took about one-third longer to pick stock and load trucks, and at the customers’ location it took longer to unload. Overall, it meant that deliveries were reduced from two a day to one. The reduced delivery capability and increased delivery costs over Songkran have an economic cost to companies and the economy as a whole. 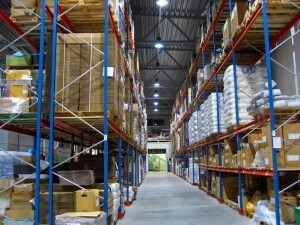 Warehousing costs typically account for 1.2 per cent of sales and transport costs 0.8 per cent for a combined total of 2 per cent of sales. Needless to say, large chains such as Makro, Tesco-Lotus and Carrefour account for the majority of the supply during this period and for them inventory management is directly reflected in the bottom line. Managing inventory can be a delicate balancing act at the best of times. Previous research showed that on a monthly basis even the best-performing retailer was out-of-stock once a month on 24 per cent of items carried. The average was 48 per cent and the worst 68 per cent. During Songkran, Edwards expected to see many retailers performing at the bottom end of this scale due to delivery inefficiencies. Edwards said that this translated to about 8 per cent of products being out-of-stock on any one day and that studies by various companies had shown that this translated to 5 per cent of lost sales on that day for an average-performing company. “Retail sales in Thailand in 2001 were about Bt1 trillion – 5 per cent of this is Bt50 billion. Therefore if we say we went from average-performer to bad-performer over Songkran this could translate into an additional Bt25 billion in lost sales as a result of supply-chain inefficiencies,” he said.